All about my Morris Award experience, up at BookPage. Edited to add: Lytherus is giving away 10 signed copies of Seraphina! Go enter while there’s still time! 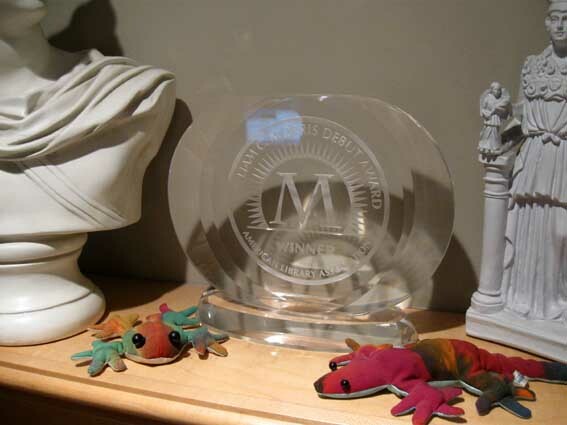 Our friend the Morris Award, flanked by Apollo, Athena, the frog, and the ‘mander. So as most of you have probably already heard, Seraphina received the Morris Award for best YA debut novel yesterday. I feel so fortunate that I got to be there in person and hear it announced. I got to meet this year’s Morris committee, shake hands, have pictures taken (including one where we all wore fake moustaches! Librarians are sillier than is commonly supposed), and just feel so very loved and encouraged all around. I managed to give my speech without falling off the stage, and they gave me a standing ovation. I have never had a standing ovation before in my life, and I was a pretty good belly-dancer back in the day. Anyway, it was wonderful. I got to see a whole bunch of Random House people I met last spring, meet a few I missed when I was there, and meet the new publisher, Barbara Marcus, who’s been the energy and impetus behind the new edition of Seraphina that’s coming out (maybe sooner than expected! I’ll get a date for you). She was so kind and encouraging, and she reminded me of Hannah, my boss at Children’s Book World, which was great. I’m feeling all excited to get back to work now! O what a beautiful Friday! Hello darlings! I have an item of interest and another of good news, and the sun is shining, and… and… *whew! * okay, deep breath. Firstly! I have an interview up at YALSA’s The Hub! We talk about my Morris Award nomination, music, dragons, and other good stuff. Thank you so much Jessica and YALSA for all the kind attention! Nextly! I have been nominated for this year’s Golden Tentacle Kitschie Award. No, really, that’s a thing, and not just anything, but an AWESOME THING. The trophy is – get this – A TENTACLE. I know, right? I generally try to approach these nominations with philosophical equanimity, and it is such an honour to be short-listed. I’m trying not to get my hopes up too much, but, well. It’s hard. Thirdly! I had lunch yesterday with Elizabeth May, author of upcoming urban fantasy The Falconer. It was super nice of her to cross a whole ocean just to have lunch with me, and I had a great time. The wonder of the internet, eh? We can have friends and colleagues all over the world. 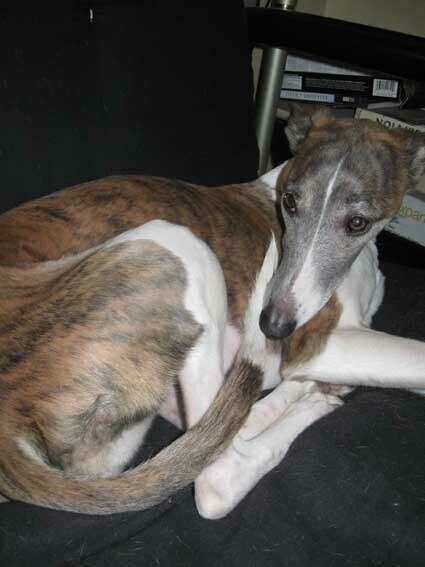 My dog, in an effort to keep me humble and grounded, is whining to go out. She’s having digestive issues, which is just as glamorous as it sounds. That’s all for now, friends! She’s cute even when she’s sick and whiny.